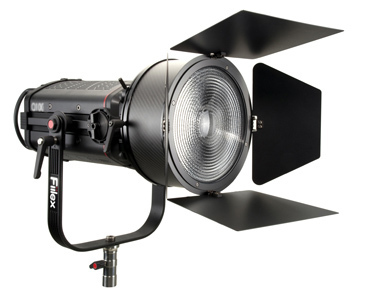 San Francisco, CA - April 2nd, 2015 - Fiilex, a leader in LED lighting for the broadcast, film and photo industries, announces the release of four new accessories. We're kicking off this year's NAB product release with a new line of accessories for the Q-Series. Our goal is to give you the most versatile line of lights on the market, starting with these incredible new releases! The 8-Inch Fresnel attaches easily to the front of any Q-Series light, narrowing its beam angle to a range of 25°-10° and increasing the intensity of the center lux by an astonishing 15x. To build the strongest and lightest accessory possible, we've crafted the housing from carbon fiber tubes and the Fresnel Lens itself has been designed completely from scratch with a new polycarbonate material. 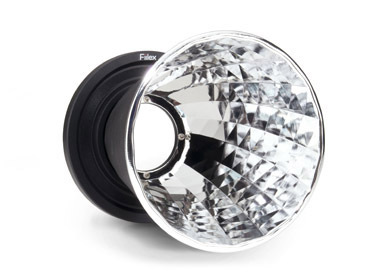 The innovative design of the 8-Inch Fresnel gives you a modifier that is lightweight, damage-resistant and transmits 10% more light than a normal glass fresnel lens. With a deep parabolic shape and multiple diffusion layers, the gorgeous 35" Para Softbox pairs with any Q-Series fixture to create a soft light that wraps smoothly and casts a clean shadow. A shiny silver interior maximizes the internal reflection and pushes out light while the removable front face, grid, and inner baffle diffuse the source. Get beautiful, even diffusion and gentle wraparound illumination with this stunning new accessory. 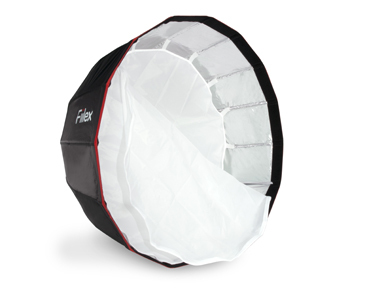 Easy to assemble and easier still to use, the 16-pole Para Softbox is an elegant complement to the Q-Series line, providing photography and motion picture professionals with high quality diffusion whenever they need it. Designed to boost the brilliant output of any Q-Series light, the conical PAR Reflector fits to the front of the light and produces the feeling of an open face with great intensity. The reflector's shiny silver interior and distinctive parabolic shape concentrate the light, amplifying its intensity by 6x in order to deliver a punchy, crisp look that flatters skin and creates clean shadows. The PAR Reflector gives you easy control over the directionality of your spread, with the 6" diameter front face narrowing the beam angle from 65° down to 16° in order to provide a hard light and crisp edges that drop off sharply. A useful tool for layering controlled lighting and adding deeper depth to your shot, the PAR Reflector lets you highlight facial features in close shots and throw light far into the background to accent hard-to-see details. 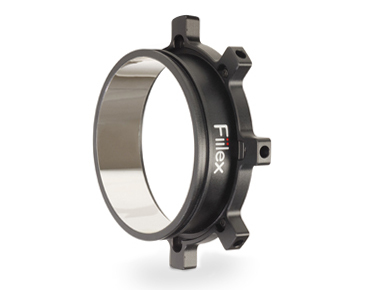 With an 8 rod-hole configuration, the new Fiilex Speed Ring for the Q-Series light is designed to accommodate most standard 8-or 4-pole softboxes/ octaboxes from brands like Chimera, Profoto, and Wescott. Lightweight and durable, this aluminum speed ring slides easily onto the front face of all Q-Series lights and can be rotated a full 360 degrees for better softbox orientation. With the Q-Series Speed Ring, you now have even more options for customizing your lighting kit and getting just the right look for your shoot.